How do I use a printer that's on another machine on my network? 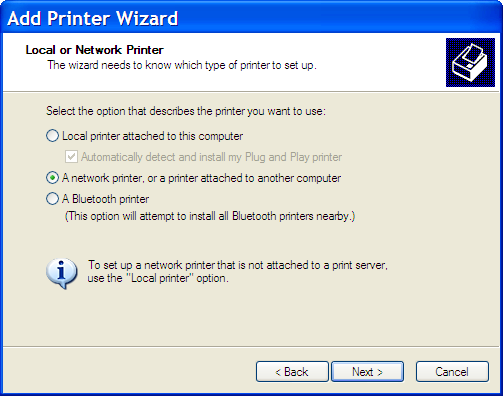 Once Windows Networking is enabled on your local network it's relatively easy to share printers as well as files. We'll walk through the steps. I have a wireless network with 2 computers ( A & B ) and a printer ( A1 & B1 ) physically connected to each computer. A is connected to A1 and B is connected to B1. My question is can I use computer A to print to printer B1 or computer B to print to printer A1? I do not want to make the printers wireless at all. Assuming that computer "A" and computer "B" can "see" each other across your network, it's actually a relatively simply matter to print on either printer from either machine. 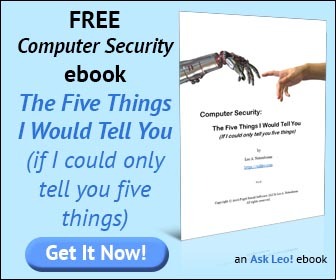 You may note that one of the things I don't spend a lot of time discussing here on Ask Leo! 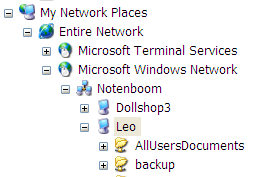 is Windows Networking. Getting two Windows machines to see each other and successfully share files can at times be incredibly frustrating. When it just works (which it often does) it's great. But if you encounter problems there are so many things that could be wrong, it's just not a topic I take on very often. The trick is simply that you can share a printer on your network just like you can share a folder. "The trick is simply that you can share a printer on your network just like you can share a folder." Make sure that Share this printer is selected, and give your printer a name. As you can see I've given my printer (what you've called "A1") a name of "hppsc131". In order to use this printer from another machine you'll need to add it as an available print. You can, if you like, try browsing for a printer. Windows will "look around" to try and locate any printers that are shared by any machines on the local network. The next page of the wizard will ask if you want to use this newly connected printer as the default printer. Select Yes or No as you see fit and click Next. The final page will summarize what you've just done. That's really all there is to it. Now, on this machine B I can print to the printer on machine A. Since you've indicated that you also have a printer on machine B that you want to print to from machine A, you'd simply repeat this process again, this time sharing the printer on B and connecting to it from A. Why does my Microsoft Word document display differently on different computers? Microsoft Word documents display differently on different systems because of differences between the systems. Getting Microsoft Word documents to display identically typically means processing them into something else. Why does my computer 'Find New Hardware' for my printer every time I boot? There is an article published by Microsoft on what to do if your computer displays 'Found New Hardware' for your printer every time you boot. I express my despair for the state of networking for "average" computer users these days. When trying to add a printer to my network so the remote laptop can print from it, I can't expand the network and see the printer that is wired to desktop? Both my computers on the network were named by the programs. Both are XP. I can print from my newer computer to a DellAiO in the bedroom on an older computer, but I cannot print from my new Kodak printer on my newer computer to the Dell in the bedroom. It browses and finds the printer and when I click next, a box comes up and says the name is either wrong or the printer is not connected to the server which it is if the browsing found it. Is it possible to use printer network with two different computers ( 1 Macbook and 1 Asus notebook)? Both units are wifi ready. Why does my wife's laptop no longer connect to the wireless printer? I did as described and I get "The server for the printer does not have the correct driver installed." I search for the correct driver, but cannot find it. 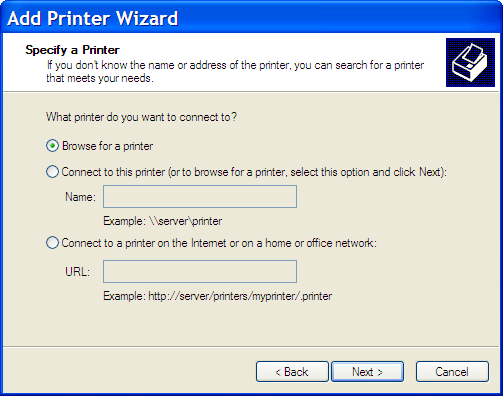 How do i set up a win 7 machine to use a printer that is networked through win xp machine? hi,yo articles are rily helpful m learnin alot of stuff frm u,thanks.i've read yo article on sharin a printer on da network.i've connectd to a shared printer on da network to c if i can print frm it,but da statu of da printer is showing offline.can it print while offline? Hi, I have a Windows Vista machine that is sharing a local computer on a peer to peer network running Windows 7. The issue I'm encountering is I can install the network printer on the other machines when I'm logged in as the administrator. However, when I log in as a standard user and attempt to install the network printer it prompts me for username/password to connect to the printer. I enter in the username (i.e. jsmith) and a password. It works for a moment and then comes back indicating the credentials aren't sufficient for the network resource (printer) and asks if I'd like to enter alternate credentials. I answer "yes" and it gives me the standard login screen with the exception that the username field is pre-filled with the connecting computers machine name/username (i.e. machineA\jsmith). I've tried using the "run as" feature and installing the printer that way but still get the machine name pre-filled. The problem is that the machine name is not part of the login credentials on the machine sharing the printer but I don't know how to tell Windows not to include the machine name of the system requesting to print (or install the printer). Any help is very much appreciated. Thanks in advance (and thanks for your articles - they've been a blessing). Take care.